Juliet sneaks out of her bedroom at night to meet Romeo. She sprinkles rose petals on the ground and lays down a blanket. She’s preparing for her first time, and the scene evokes memories of young love that will resonate with many in the audience. 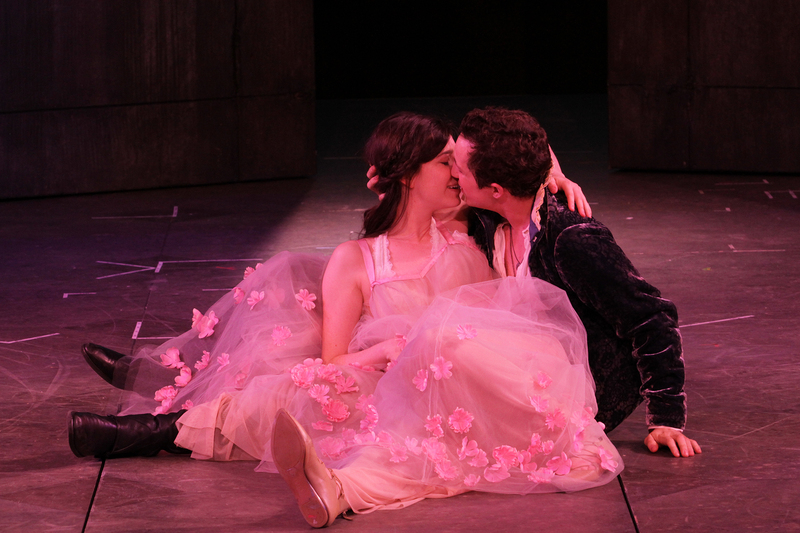 Romeo and Juliet share a tender, romantic night under the stars and plan to be together forever. Andrew Chown and Hailey Gillis shine in the title roles. They made me believe in their love, in their innocence, and in their anguished demise. I think this play, as tragic as it is, is a tribute to love, teaching us the importance of pursing it against all odds. Yes, the ending is extreme with both lovers taking their own lives, but so often theatre goes to extremes to get a point across. Their deaths are the result of a family feud, and we are warned to against letting hatred get in the way of love. Another one of my favourite performances was Jennifer Lines as Juliet’s nurse. As a big sister might, she covers for Juliet, helps her meet up with Romeo, and enables their marriage. Her unabashed joy at helping Juliet fall in love is so endearing and she selflessly continues to aid the couple even after Romeo kills one of the Capulets. Romeo and his two friends, Benvolio and Mercutio, provide some comic relief as they egg him on and provide plenty of sexual innuendo. 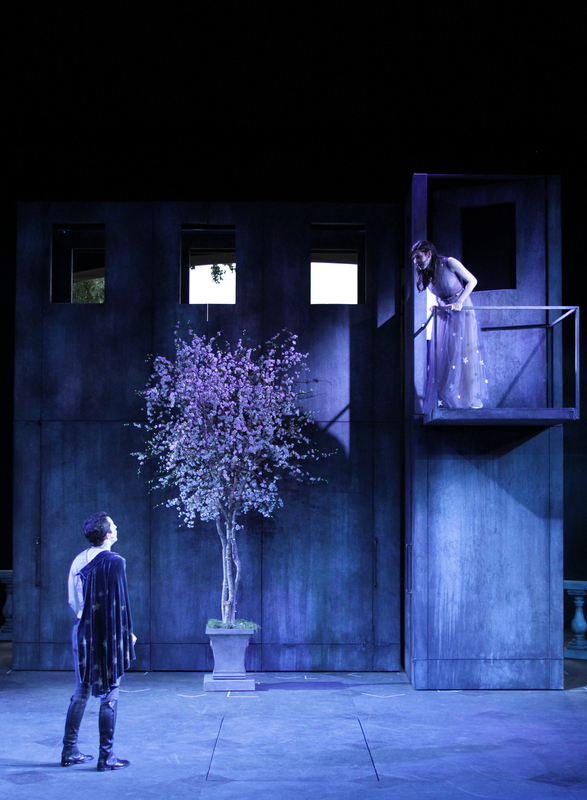 The minimalist set had me worried before the play got started, but the tall movable walls were versatile and functional, providing a neutral backdrop to which small adornments could be added to set the scene. And the costumes were understated yet striking, particularly the choice of sheer, girly dresses for Juliet that emphasized her youthful innocence (she is only 14!). What may seem like a cliché narrative is nothing of the sort when performed and directed well. Kim Collier, a masterful director, pulls out as much relevance as she can from the story and presents the tragedy for us to decide for ourselves: what is the solution? Many young lovers are faced with similar dilemmas of coming from the wrong families, of opposing parental opinions, but how can we overcome this? If it isn’t Montagues versus Capulets, then it’s two opposing religions or classes that don’t think their children make a good match. It’s the most iconic love story representing unbridled teenage passion, unrequited love, and rebellion. Although I already know how the story will end and I have seen this story countless times in ballets, musicals, and movies, it still has the power to move me, to elicit sympathy for the characters, and to teach me something new about love each and every time I watch it.